Last night we had a mid-winter, get out of the house night on the town with family members. After dinner at the Tip Top, we Ubered down to the Big Bang Bar in the Arena District for a Dueling Pianos performance arranged by Sister Rocker. 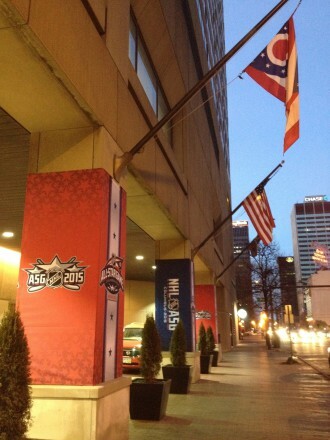 I wasn’t even aware of the place, but then the Arena District is full of surprises. When Sister Rocker first suggested a trip to see Dueling Pianos, I initially thought it would be like Ferrante and Teicher, or perhaps cocktail lounge piano music. I could not have been more wrong! This was about as raucous as piano music (and a drum set) can get, with three guys rotating on stage in staggered one-hour shifts and pounding away at the keyboards of two grand pianos. They took “suggestions” (song requests unaccompanied by money) and “requests” (song requests submitted with moolah) — guess which ones were going to get played, and which would get crumpled up and tossed? — and they played everything from vintage Jerry Lee Lewis to country to ’80s MTV staples to last year’s hip hop hits. And there’s a lot of audience participation, both through singing along and through birthday and anniversary celebrants and bachelorette parties going up on stage to dance and perform. It makes for a rollicking time and it’s obviously popular, because the place was packed — as crowded a venue as I’ve seen in years, in fact. If you reserve a table, as we did, expect to feel a bit like a sardine, because they really pack people in. It’s a young crowd, too; we were the oldest attendees by far. And the amount of alcohol consumed by the patrons — the better to lubricate the vocal cords and loosen up lascivious onstage dance moves, I guess — was colossal. This was a crowd that was ready to rock out and fight the mid-winter blahs with some liquid-fueled entertainment. Dueling Pianos isn’t something I’d do every weekend, but it’s a nice entertainment option to have on a cold winter night. If you’re in Columbus and you’re looking for some good live music, take a gander at the music venue sites and see whether Hello Emerson is playing somewhere. Kish and I caught the trio last night with Dr. Science and the Bionic Half-Marathoner at The Basement in the Arena District, and they’re definitely worth a good listen. In the interests of full and fair disclosure, I should add that Jack Doran, the keyboard player and percussionist for Hello Emerson, is the oldest son of Dr. Science and the BH-M. I don’t think I’m influenced by bias, however, in saying that Hello Emerson plays some interesting and tuneful music that just might get you to thinking about life. 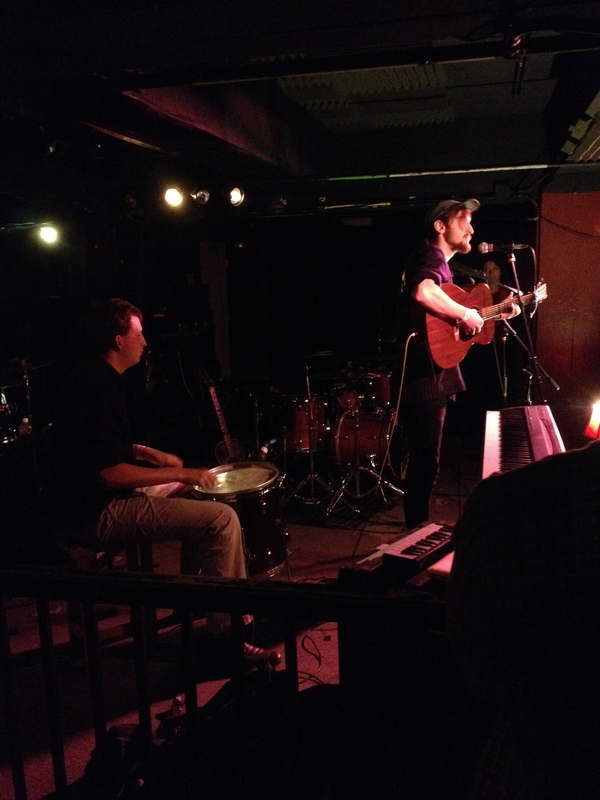 There was a pretty good crowd at The Basement to listen to them last night as the first band in a three-band show, and the group got a rousing ovation at the end of their set. According to Sam, the guitar player and lead singer, Hello Emerson plays regularly at the brilliantly named Kerouac Kafe in Columbus. Catch them if you can! Yesterday was one of those hot, muggy days that seem to immediately drain you of energy and leave you coated in sweat at the same time. We were interested in heading down to the Short North, but walking there would have caused us to melt into the sidewalk. And driving to the Short North on a Gallery Hop day is a colossal pain. So, what to do? The CBUS is a “circulator” that runs on a continuous loop on High Street and Front Street between German Village and the Brewery District, on one end, and Victorian Village and Italian Village on the other. Along the way, it has stops at Columbus Commons, the Ohio Statehouse, the Arena District, and the Short North. And there are no worries about reading a confusing bus schedule, or getting on the number 4 bus when you should be getting on the number 23 bus — the CBUS has different, readily identifiable markings, the CBUS stops are marked with a special circular sign, and the CBUS just goes on the same route all day long. The CBUS is clean, bright, and blissfully air-conditioned. The upcoming stops were announced verbally and shown on an electronic crawl screen at the front of the bus, so you always knew which stop was upcoming. 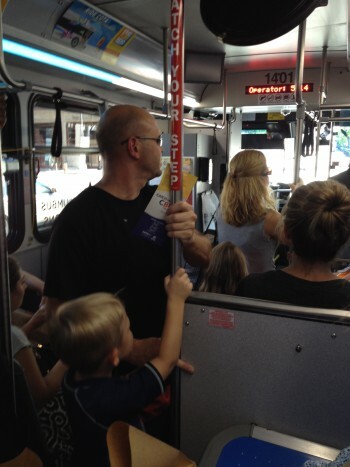 Our fellow passengers included couples, families with small kids, and Columbus visitors heading to an event at the Convention Center, which also is along the route. There are multiple stops along the way, and you can signal the driver when you want to stop by pulling a little cord that runs behind every seat. And the CBUS is free. Free! What could be better than that? One other thing about the CBUS that the BRC has emphasized: it runs almost exactly the route that some people have proposed as the route of a street car/light rail system, and it does so at a tiny fraction of the cost — and without ripping up the streets and installing rail lines and paying for the construction and the train cars. We liked the CBUS so much that, on our ride back home, we talked about how we can use it even more. I’m guessing that most users of the CBUS have that same reaction. It promotes the interaction and flow between core downtown neighborhoods, and it also makes non-bus-riders like us a bit more amenable to potentially using the Central Ohio Transit Authority options to meet our other transportation needs. That’s the whole idea, I think. I’m not sure how long the CBUS will be free, but I hope it continues — it’s a great idea and way to introduce the non-BRCs of the world like us to the possibilities and advantages of mass transit.